Read Portuguese folk tales from Charles Sellers and Elsie Spicer Eells in a rich and beautiful collection. Read from full list of Portuguese tales. About: In folklore from Portugal, beautiful origin stories unfold about how islands sprung from flowers dropped by an angel in Paradise, or more humorously why dogs sniff each other when they first meet. 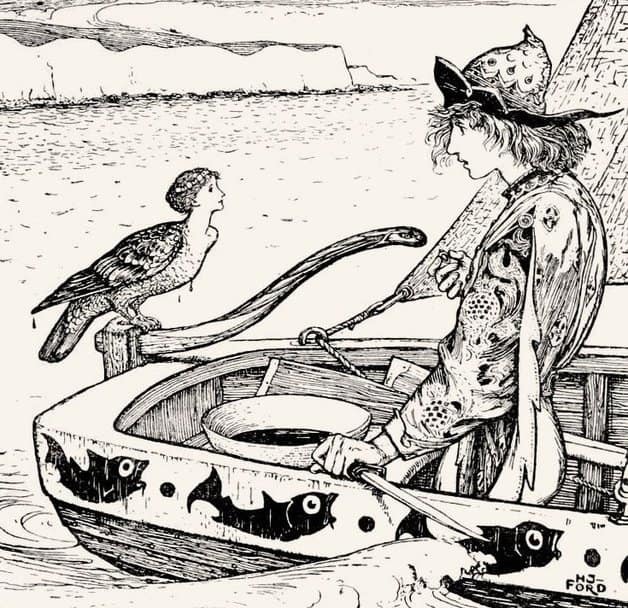 Throughout the folk tales, whether from Portugal or Brazil, Roman Catholic influence weaves its way into these tales of enchantment and adventure. “For a moment, the dove’s head became that of a beautiful girl.” Illustration by H.J. Ford, published in The Violet Fairy Book by Andrew Lang (1901), Longmans, Green and Company. Elements of the Catholic Church make their appearance in folk tales from Portugal, with heroes seeking assistance from Mother Mary, and captured girls holding strong to their convictions. It’s not possible to remove the Catholic Church’ s influence from these fairy tales; reading the folklore of the country, you can see they are grafted together and form a folkloric tradition unique to the people of Portugal. From her collection, Author Elsie Spicer Eells traveled extensively throughout South America and collected Portuguese folk tales in Brazil that had been brought over by Portuguese settlers. Her stories are richly infused with both cultures, and include epic adventures and awe-inspiring giants. Portuguese author Charles Sellers gave the world Tales from the Land of Nuts and Grapes: Spanish and Portuguese Folklore; the collection features stories for children from the high mountains of Portugal to the mesetas of Spain. Prior to its publication, there wasn’t a collection of Portuguese folklore like his – his work preserved many of the tales told by the elders. Renowned folklorist Andrew Lang also collected Portuguse fairy tales and folk tales in his various fairy books.